Carolina Kitchen catered our staff luncheon and did an amazing job! Everything was delicious and delivered right on time! Thank you, Clay and staff for a great lunch! Ordered Brisket and Ribs for my 60th B-day party. It was fantastic. There was plenty of meat and the guests loved it. Definitely the best BBQ in town. The food is always amazing, moist and cooed to perfection. Clay was very patient with our various changes and the delivery was on time, set up perfectly and courteous. Food and service were awesome! We will be using Carolina's again. You won't find anything even close. Great Food and Great to Work With! 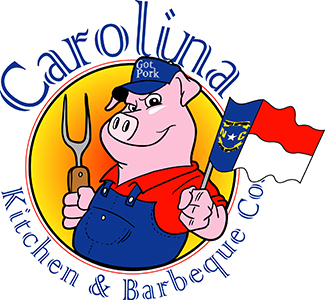 Clay and team at Carolina Barbeque Catering, were great to work with. We really appreciate how easy it was to be in communication with them. Clay was willing to work with us and help accommodate our needs. Everyone loved the food, the service was great! Open House catering for 115 guests. We're a Barbecue Caterer that just served them our Loaded Fries and Pulled Pork Sandwich. Training Class Luncheon catering for 16 guests. We're a Barbecue Caterer that just served them our BBQ Party Pack A with Tater Salad, Baked Beans and Green Salad w/ Dressings. Employee Appreciation Luncheon catering for 20 guests. We're a Barbecue Caterer that just served them our Sandwich BBQ with BBQ Chicken Breast, Baked Beans, Mac & Cheese and Green Salad w/ Dressings. Office Luncheon catering for 10 guests. We're a Barbecue Caterer that just served them our Two Meat BBQ with Pulled Pork, Smoked Pork Ribs, Tater Salad, Mac & Cheese and Smoked Brisket Beans and Drink Pack - $1.84 Per Guest. Office Luncheon catering for 20 guests. We're a Barbecue Caterer that just served them our Baked Potato Bar with Pulled Pork and Smoked Pork Ribs- Slab Only. Client Appreciation Party catering for 15 guests. We're a Barbecue Caterer that just served them our Mexican Taco Bar and Chafing Dish- Full Size. Office Luncheon catering for 15 guests. We're a Barbecue Caterer that just served them our BBQ Party Pack B with Other, Mac & Cheese and Baked Beans, Bread Pudding, Chocolate Chip Cookies $.99 and Dinner Salad. Family Reunion catering for 50 guests. We're a Barbecue Caterer that just served them our Chafing Dish- Full Size, BBQ Chicken, Gallon Smoked Brisket Beans and Quart Smoked Brisket Beans. Birthday catering for 35 guests. We're a Barbecue Caterer that just served them our Beef Brisket-Akayshi Wagyu, Smoked Pork Ribs- Slab Only, This meal is cold and Chocolate Chip Cookies $.99. Office Luncheon catering for 16 guests. We're a Barbecue Caterer that just served them our The Carolina Dinner - Brisket with Baked Beans and Mac & Cheese, Cat Fry Pack, Rib Pack with Red Beans & Rice, Collard Greens and Hushpuppies and 2 Chicken Strips. Office Luncheon catering for 10 guests. We're a Barbecue Caterer that just served them our Pulled Pork, Smoked Pork Ribs- Slab Only, BBQ Meatballs, Quart Mac & Cheese, Quart Tater Salad and Quart Baked Beans. Employee Appreciation Luncheon catering for 70 guests. We're a Barbecue Caterer that just served them our BBQ Party Pack C with Smoked Brisket Beans, Mac & Cheese and Tater Salad, BBQ Party Pack B with Smoked Brisket Beans, Mac & Cheese and Tater Salad and Brownies. Office Luncheon catering for 90 guests. We're a Barbecue Caterer that just served them our Two Meat BBQ with BBQ Chicken, Marinated Tri Tip, Green Salad w/ Dressings, Mac & Cheese and Smoked Brisket Beans and Vegetarian Meal. Office Luncheon catering for 20 guests. We're a Barbecue Caterer that just served them our Two Meat BBQ with Pulled Pork, Beef Brisket-Akayshi Wagyu, Mac & Cheese, Smoked Brisket Beans and Coleslaw. Office Luncheon catering for 50 guests. We're a Barbecue Caterer that just served them our Two Meat BBQ with Beef Brisket-Akayshi Wagyu, Smoked Pork Ribs, Smoked Brisket Beans, Tater Salad and Green Salad w/ Dressings, Chocolate Chip Cookies $.99, Chafing Dish- Full Size and Plastic Table Cloth.